I will be giving the second Prairie Sagebrush Award to my blogroll friends in a few weeks. It is the second year of recognizing fine creations on the blogosphere. Read last year’s award-winning posts: Prairie Sagebrush Award 2010. 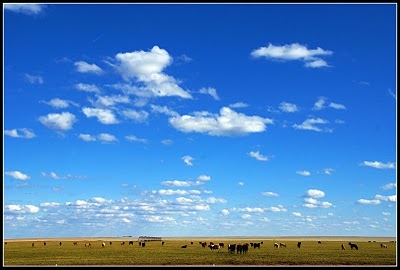 I select a post, photograph or artwork that has been composed in the last year, say, from June 2010 to May 2011. It’s a celebration of a year of my blogging. There’s no first, second or third. I select the post, photograph or artwork that was meaningful to me and the universe and create a ONE POST ANTHOLOGY of all the fine work created. It’s a long post, but well worth bookmarking. For every comment made on the ANTHOLOGY POST for Prairie Sagebrush Award 2011, I will donate one buck to a wildlife corridor in Texas or New Mexico (limit is $500). Last year I donated thirty-five dollars. I’ll be posting a couple of my favorite posts from my blogroll before the big revelation on June 1, 2011 — if not before. The best sentences from my friends on the blogroll for the week of March 7-March 13, 2010. If the blogger did not post during the week, they are not quoted. Old rose species are continuing the comeback they started about two decades ago, with vigorous, brilliantly-scented gallicas and dog roses gaining favor as tough, droughty hedges with tasty hips. –Coyote Crossing, Chris Clarke, on the failure to engineer genetically a blue rose. I promise to try everything once (and all the good things twice) and let you know what I most highly recommend. —Bunny Terry, I Love New Mexico Blog, on attending the Fiery Foods Show. Mother Nature’s invitation to a spring party has begun: Canadian geese fly overhead, a chorus to the tulips that nudge skyward; opened windows mean fresh air. –Kittie Howard, The Block, on spring and receiving The Honest Scrap Award. The Honolulu Bar is the lone outpost in a service-less landscape of rusting panel trucks and constant wind. It’s four miles down Proving Ground Road where the paving and the world seems to end. –Karen Rivera, New Mexico Photography, on driving between Oregon and New Mexico today, lamenting the recession’s effect of closing Arizona and Mojave rest stops. The principles of Ho’oponopono disarm the tendency to blame others for our frustrations by taking on full responsibility for any discord, and killing it with kindness. —Kristy Sweetland, Stark Raving Zen Blog, on a variation of the Hawaiian philosophy and psychology to achieve a life in balance. I’ve had potential tenants surveying the birdhouse in the carport this past week (Mountain Chickadees, I believe), and Hairy the woodpecker has been happily beating the daylights out of the vigas in the same carport…leaving his sawdust below. –Martie, Taos Sunflower, on Spring is in The Air. The road unfolded before me in quiet beauty. –Teresa Evangeline, on her trip to Maine from Minnesota, comment near Lowell, Massachusetts. El Paso is blessed with poppies in the Franklin Mountains in years with good rain. This year it looks to be a great one for a beautiful display. 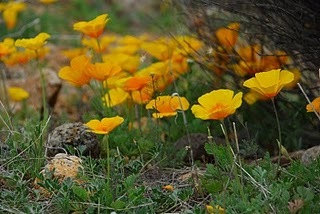 —Texas Mountain Trail Blog, on the emergence of poppies near El Paso, Texas. Spring has finally come to central Texas and the trees are beginning to bud, the wildflowers are starting to pop and the rivers are running freely. I’m feeling that old familiar itch to get out and see the countryside. –Jeff Lynch, Texas Photography, on the impulse to bolt from the cabin and end the fever. A really good movie — and why waste time on anything else — is like a good novel or poem; it deserves to be savored. —Coffeeonthemesa’s Blog, on watching movies at home rather than a public theater. I hereby declare an end to Cabin Fever. Even the calendar tells me that spring equinox arrived Friday, but better evidence is found by a stroll outdoors. –Jerry Wilson, Observations from a Missouri River Bluff, posting in March 2009. These are some fine sentences from my blogroll I read during the week of February 28-March 6, 2010. If a writer has not composed during the week, I do not make a selection. Refer to the writer’s blog for the full posting. See blogroll on the right margin of this page. He ate the food provided, slept on a bunk bed in a rough barrack, and saved every pay check. Pa worked dawn to dusk beneath a scorching sun, endured the thick humidity, and avoided malaria….My grandfather carried his true love over the threshold. –Kittie Howard, The Block, on her grandfather working on the Panama Canal, buying land and building a home and parlor in Louisiana for his wife. I told them once, “Mantengan su uso de las dos lenguas. La mente de una persona que sabe dos es mas lista.” Keep your knowledge of two languages. Your mind is smarter knowing two.” –By C.C., Color of Sand Blog, on teaching several students from Chihuahua in Bernalillo, New Mexico, Middle School. Centennial Flat is a place I’ve spent a little time, and I was wondering if I might recognize any of the individual Joshua trees even after eighty years of change. That little one in the middle there almost leapt out at me. Let’s take a closer look. —Chris Clarke, Coyote Crossing, on comparing Joshua trees in the Mojave from photographs taken eighty-years apart (see photos on his blog). Old retablos, santos and other holy artifacts are in the church. The pews beckon you to sit, to pray, to stay awhile. Turquoisie Moon, on visiting the Catholic church in Chimayo, New Mexico. My dad never misses a beat, just moves a little faster and they are fifteen again, unmarried and without children, dancing at someone’s house after church on Sunday night over in the Porter community. Then dad grins at me and I know this is my life and they are right here, still happily in love with each other and glad to have us. —Bunny Terry, I Love New Mexico, on being in the second grade and transcending the criticisms of her second-grade teacher. The small villages along Highway 55 have always held a special place in my hard-scrabble New Mexican heart. Using the few resources available in the barren, harsh acres, early settlers recycled the ever-present rocks into homes, walls, and churches. —Karen Rivera, New Mexico Photography, comments on photographing The San Antonio Church near Moriarty. I was simply told to follow my heart. –Kristy Sweetland, Stark Raving Zen, on the motivation to write, despite it all. Oh…and the best news yet…it is sunny today, that full up, in your face sun, complete with crystal clear blue skies. –Martie, Taos Sunflower, on shaking off the winter blues in Arroyo Seco, New Mexico. Meanwhile, down on Main Street, I could hear the sound of a dulcimer. I walked back down and saw a gal sitting on a bench, playing it as it laid there across her lap. It was the sweetest sound I’d ever heard. –Teresa Evangeline, on visiting Cripple Creek, Colorado, in 1975. If it’s a choice between a lens or a bottle of water, always take the water. The Texas sun can be a relentless companion in the Hill Country and folks that don’t respect its strength soon find themselves dehydrated and exhausted. Not a great combination for a nature photographer. –Jeff Lynch, Photography, on how to survive photographing in the Texas Hill Country in spring and summer. A time comes each winter when we look at our dwindling wood pile and wonder how we managed to burn so much wood and it’s only February. Most years we keep on top of it, but sometimes — for one reason or another — it gets away from us. 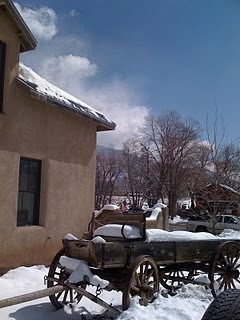 –Coffee on the Mesa, Taos, on running low on firewood at the end of February. It was the flower child, peace, love, or to me it was feelin’ groovy. —Evangeline Chavez, on the 1960s and 1970s and what the decades meant to her. These are some fine sentences from blogs I read during the week of February 21-27, 2010. If a writer has not composed during the week, I do not make a selection. As a general rule, I read the blogs listed here on Sage to Meadow and The 27th Heart, my other blog, and pick fine sentences. I read at the Renaissance Festival for years. Our booth had many fine readers, but noticed some were simply downers. –Turquoise Moon, reading at the Kansas City, Kansas, festival. It is twilight, and the snow makes all a soft glow. Spring will come. It will come. It will. Coffeeonthemesa, Taos. If you’re making a ton of money, but how you’re earning it is literally killing you, then nothing else matters but re-focusing. The cars, the house, the fancy clothes… None of it matters but your happiness, your health, your ability to live freely-societal expectations be damned. –Stark Raving Zen on changing occupations, overcoming the affect of depression. I know what makes me happy — being in the desert — and it’s readily available, just an hour away. –Chris Clarke, Coyote Crossing. Slowly I pieced my household together, and in the process my life started to get some of its form back. 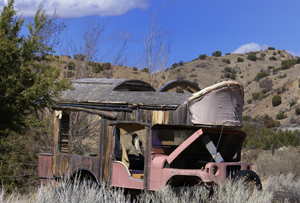 I Love New Mexico Blog, on a double-wide trailer at Ute Lake, New Mexico. My rinky-tink ‘61 Morris Mini-Cooper S supported legions of mechanics on its wiring problems alone. On one ill-advised trip south, with yet another electrial crisis, I pushed my non-working sportscar into Guaranteed Tire in Mountainair. –New Mexico Photography, Sebastian on Mountainair Guarantee Tire Shop, 1975. Every child should have access to nature’s mastery. It’s the birth of reverence. Sea Mist and Sunsets, on the aquarium at Monterey Bay, California. Sunshine so bright the snow looked alive with jewels everywhere you looked. Sunshine so bright our skies were that incredible blue we’re famous for. Sunshine so bright I spent the day smiling and feeling like I had suddenly lost a huge weight off my shoulders. We were all smiling…even the dogs…no kidding. –Taos Sunflower, on the sunshine in Arroyo Seco and Taos, February 24, 2010. Valentine seems like the last holdout, a vanguard against change, the kind of change that has occurred across our country, creating a deep divide that appears untraversable. I don’t long for the way things were. I do long for a strong sense of community where people look out for one another and find solace in their shared lives. –Teresa Evangeline, on visiting Valentine, Nebraska, returning from Santa Fe, winter 2010. But winter has a beauty all its own, full of photographic possibilities. The sun is lower in the southern sky, casting wonderful shadows and creating dramatic contrast. The air is crisp and clean and you can capture details seldom seen during the hazy summer months. The lack of color pushes the mind to see texture and detail often missed during more vibrant times of the year. –Jeff Lynch, on photographing McKinney Falls near Austin, Texas. These are some fine sentences from blogs I read during the week of February 14-20, 2010. If a writer has not composed during the week, I do not make a selection. As a general rule, I read the blogs listed here on Sage to Meadow and The 27th Heart, my other blog, and pick fine sentences. The 27th Heart is almost identical to Sage to Meadow in content. You can read the full posts of these fine sentences by clicking on my blogroll here on Sage to Meadow or The 27th Heart. I’ve got to get out of here, if just for a little while. I’ve got to breathe some fresh air! I headed for my room and got dressed in some warm clothes. Heavy socks, shirt, sweater over the shirt and breeches. Headed for the garage, found my riding boots, fingerless gloves and jacket, hopped into the car and took off for the barn. Now this might sound strange to some, but for me, this was therapy. –Turquoise Moon, Daily Om, upon getting out of the house after the death of her husband. I’m shifting, branching out into more modern art pieces. I’m not happy with the place I am right now, my work is not fulfilling me in the way I want it to and I’ve been increasingly frustrated. –Katie Johnson Art, on going in a new direction in her painting. Cerillos is the Yin to Madrid’s Yang, the definite shadow city on this trail of powerful contrasts. There’s a heaviness here. A quiet darkness. –Kristy Sweetland, Stark Raving Zen, on photographing Cerillos, New Mexico, the Turquoise Trail. She is not sitting around wondering if you’re going to make the right decision for her. She wants your comfort, your company, your love. Give her that — give yourself that — and the rest will follow. –Coyote Crossing, Chris Clarke, on knowing when it’s time to put your dog, your companion, down. My grandparents married in 1912, and their love story is a blog post (or two or three) in and of itself, but my Grandma Ayres never let a day, if not an hour, go by without talking about how much she missed her husband, Frank, after he died. He was born Benjamin Franklin Ayres, and he is buried next to his brother, Thomas Jefferson Ayres. –I Love New Mexico, Bunny Terry, on attending a funeral in Tucumcari. At this, the factory hushed. I stood in silence while others awaited my answer. “Tell us your problem,” Yosi insisted. And, realizing that all of this factory work that helped support an entire kibbutz had come to a halt, I finally understood what a kibbutz was all about. An individual’s well-being trumped money made and money spent. For the unit was only as strong as the weakest link. –Kittie Howard, The Block, on her laundry and losing weight at the Plason kibbutz. This is really a nice escape on these grey winter days…and once again is stirring up my desire to visit the town in Mexico where my father’s family came from. Con tiempo. –Taos Sunflower, Martie, on reading “Mexican Time,” a book on her nightstand. I had arrived here, in the late fall of 2001, in a fog of emotions and with an empty gas tank. I had run out of gas, in every way, just before the first exit. –Teresa Evangeline, on arriving in Santa Fe in 2001. This section of the Pedernales River runs through one of the most prominent uplift regions of the Edwards Plateau resulting in stair-step waterfalls running for over a mile. –Jeff Lynch, on photographing the Pedernales River in Texas. It caught my breath at the rise of the arched bridge. 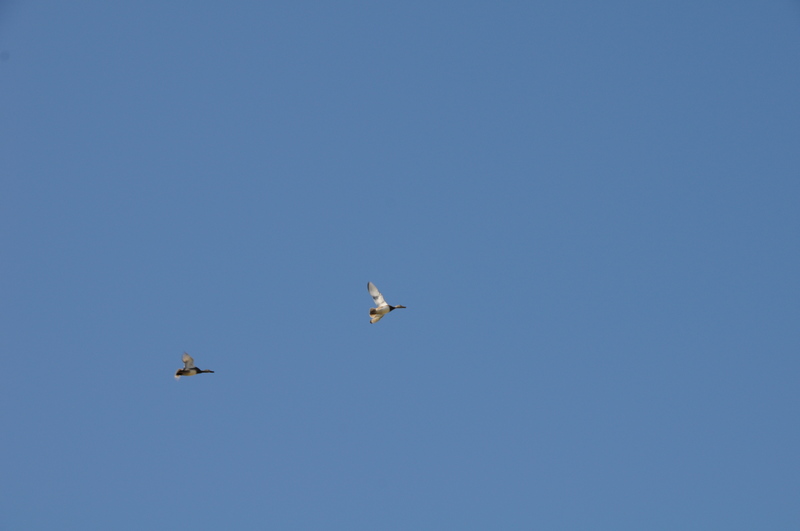 We, the mass of morning migratory workers, moved at procession speed, paying reverence to that glorious sight. A vivid sky painting lingering long enough to fill our vessels for the day ahead. –Sea Mist and Sunsets, Chris Schutz, on the commute to work, crossing Puget Sound and the bridge. Here are some fine sentences from blogs published February 7-13, 2010. You may link to these blogs by referring to the blogroll on the right hand side of any page. If a blogger has not posted a writing during February 7-13, 2010, they are not listed here. There is something broken in us if we look at the Ivanpah Valley and see not peace, but merely a way to increase our power and the profit we derive from it. –Chris Clarke on Coyotes Crossing. The name is a Spanish interpretation of the Tewa word, “nanbe,” which roughly translates as “earth roundness.” –Evangeline Chavez on Nambe Falls, New Mexico, Evangeline Art Photography. So Dave and I found ourselves in the bottom of the Canadian River canyon under the bridge, and we walked between the salt cedars and the water, which was actually quite deep for just being seepage from the dam. There was no wind, and we followed dozens of deer tracks in and out of the cattails. –Bunny Terry on I Love New Mexico. There’s something about Madrid that makes walking down the tiny winding roads without an exaggerated smile a virtual impossibility. –Kristy Sweetland, Stark Raving Zen, on visiting and photographing Madrid, New Mexico. I used to love to hand write letters, and have written hundreds upon hundreds in my years. I hear they’re still out there…friends have told me they have kept them…and that is also thought provoking to me. It’s like my history is spread out around the country in little envelopes. –Martie, Taos Sunflower, on the lost art of writing letters. I love the ritual of grinding the beans, transferring them to the filter, pouring the water in, and hittin’ that button, knowing that heaven is just around the corner. –Teresa Evangeline, on early morning and making coffee. After weeks of overcast skies and rain the rivers and creeks in the Hill Country are flowing fast and furious, which makes for some nice photographic opportunities. –Jeff Lynch, “On the Road Again,” taking photographs in the Hill Country of Texas. There is something Really Nasty out there, unbridled, coarse, and raw. –Kittie Howard, The Block, a comment on Bald-Face Lie shooting, Sage to Meadow. The best sentences from my friends on the blogroll for the week of January 31-February 6, 2010. Before I could go back down to help him cross he’d run the other way across five times as much water, and up the far bank to reach the bridge from the other side. He flew up to us smiling. –Coyote Crossing, Chris Clarke. Nestled in the foreground is the Rio Grande and in the background are the snow-covered majestic Sandia Mountains. Sandia means watermelon in Spanish. –Evangeline Art Photography. Musicians, the good ones anyway, understand the rules of music so well that they are able to venture beyond the rules of their form and create something even more true and beautiful and reflective of the true condition of human life. –HappiForever and the Hungry Ghosts. I love the cemetery in Cimarron, New Mexico, with the hazy purple mountains in the distance. I love the cemetery at Logan for its windmill in the corner and its lack of perpetual care. There are yuccas and cedar trees and a view to the Revelto Creek and the graves of my Aunt Ruby and Uncle T.H. 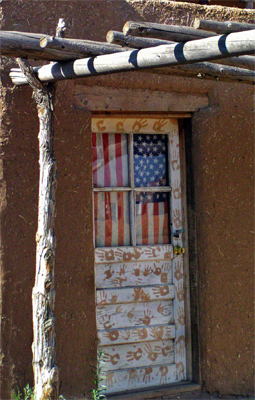 –I Love New Mexico Blog. The crowd screamed, pushed forward. I knew to lie prostrate on the hot roof. Machine gun fire continued. –The Block, Kittie Howard. I’ve spent most of my cooking career running small boutique hotels, private homes and luxurious bed and breakfasts. The best part of working small is playing with unexpected treats like gourmet fruit for garnish. Every morning is chance for a new work of art. –New Mexico Photography, Sebastian. In honesty, my favorite part of living in the land of boats, ships and all is seeing them in stillness. Of this I never tire. Sails folded, long water shadows cast. There is peace in still water and its mirrored reflections. –Sea Mists and Sunsets, Chris Schutz. There are men in orange suits and neon signs warning, “Stay Away!” or “Keep Out!” all over the place. But still, there is no sound. Just the wind quietly whistling, and that low vibrational drum beat of science. –Stark Raving Zen in the Very Large Array, New Mexico. I stepped outdoors to take this photo and the instant the air hit my skin, it brought back memories of a nine year old girl growing up in East L.A. and having the special treat of ice skating in the Paramount ice rink. –Taos Sunflower, photo of fog moving up to Arroyo Seco, New Mexico. I had set up a small piece of the yard, down beneath the far end of the clothesline and there I lived in my head and in my heart for more than one summer. –Teresa Evangeline. As I sighted through my viewfinder I knew the long hike and difficult climb had been worth it. I’d found a perfect spot to spend a few wonderful hours doing what I love the most. –Jeff Lynch, Texas Photography, upon seeing Gorman Falls near Bend, Texas. On the edge of the darkened wood, the silence falls through the stilted trees…no whippoorwill remains. –Bonnie Joy Bardos, Bohemian Artist, from blogroll of The 27th Heart. And, to be in the present eliminates our ongoing thoughts about our tragic, unhappy pasts. –Turquoise Moon, from the blogroll of The 27th Heart. Outside the week of January 31-February 6, 2010, these are two bloggers that fall under Cordilleran blogging. Christmas Eve our home is always open to our sons’ friends. 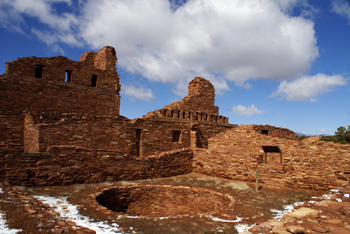 They come after Taos Pueblo ceremonies, family dinners, drinks with friends. There’s green chile stew, cornbread, cookies. Sausage Cheese Balls. We have a bonfire outside in the pit and listen to the stories of their still young lives. The moon rises above Pueblo Peak. We relive the past and laugh and tell tales. Toast to their futures. –Coffee On the Mesa. Often I gazed across to this remote ridge and wished to bridge the stream. –Observations from a Missouri River Bluff.